Each $79 box contains 30 packs. Each pack contains 5 cards. 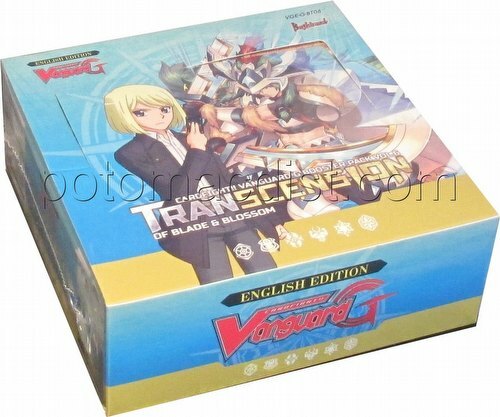 Cardfight Vanguard: Transcension of Blade & Blossom features the new trump cards for Shion and Tokoha, as they rise above the challenges that stand in their way! The set also features cards that boost the Vampire Princess of the Nether Hour Trial Deck that releases simultaneously. Furthermore, look for the 5 new Secret Rare cards, including a very popular Shadow Paladin Legion pair. Popular Royal Paladin, Neo Nectar and Nova Grappler units with new illustrations will also be included! Each pack contains 5 random cards. There are 109 different cards in the set (103 new and 6 reissue). Set breakdown is 2 GR, 8 RRR, 12 RR, 22 R, 60 C, and 12 SP Parallel, plus 5 Secret Rare reissue cards.